Looking for an old-fashioned Christmas getaway near New York City? Historic Mohonk Mountain House is a family-friendly castle in the sky offering classic seasonal activities in New York's Catskill Mountains. Set in a Victorian castle on Lake Mohonk in the Catskill Mountains, this historic all-inclusive resort is within a two-hour drive from New York City. Founded in 1869, Mohonk Mountain House is a National Historic Landmark that has hosted hosted five U.S. Presidents and countless notable business leaders, actors, artists, authors, and musicians. The resort has won numerous awards, including being named one of Travel + Leisure magazine's "Top 100 Hotels in the World" and Conde Nast Traveler magazine's Gold List of “One of the World’s Best Places to Stay”. It is also one of America's Best All-Inclusive Resorts for Families. 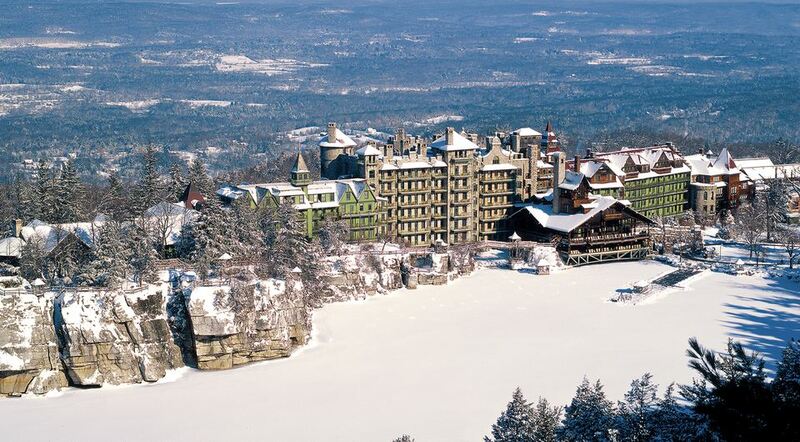 Mohonk Mountain House has been run by the same family since its founding in 1869. What started as a 10-room inn and tavern on 280 acres grew into a sprawling grand hotel with some 250 rooms. The place oozes history, from the grand staircase and intricate woodwork in the public areas to the many old-fashioned parlors and sitting areas scattered throughout the hotel. The large wrap-around porch is lined with rocking chairs overlooking the lake. Rooms, suites and cottages feature period decor and free wi-fi. Some suites have TVs, plus living rooms with pull-out sofas, and cottages include kitchens. There is a well-regarded spa, indoor and outdoor pools, an ice rink and hiking trails. Breakfast and lunch are served buffet-style, dinner is a la carte, and afternoon tea and cookies are available in a fireside lounge. Classic decorations and activities deliver an old-fashioned Christmas atmosphere that's just the ticket for a midweek escape during the holiday season. One of the most cherished traditions is the large gingerbread North Pole village scene created by the resort's pastry chef each year and displayed prominently in a key public space. Expect the atmosphere to be festive but relaxed. Families can choose to do as much or as little as they like from a roster of activities that range from wellness classes and spa treatments to arts and crafts and outdoor sports and recreation. Over the Christmas and New Years Holidays (Dec 23-31, 2018) families can experience the magic of a Victorian-style Christmas at Mohonk when the resort is decorated for the holidays with more than 15 Christmas trees, festive wreaths, and plenty of holiday cheer.